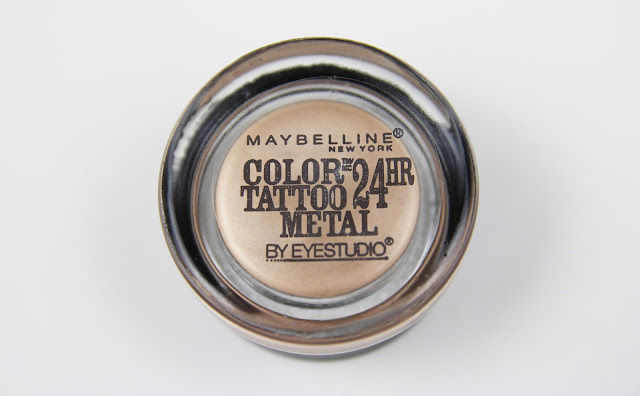 Maybelline Color Tattoo Metal in "Barely Branded"
I recently picked up this pretty little gem at my local Ulta when looking for a shadow base for my most recent tutorial featuring all drugstore products. At first glance this color reminded me a lot of MAC's Paint Pot in Bare Study, and it is pretty close. This product, like many of the other color tattoos, is amazing. My favorite part about this product is the staying power, it lasts all day and beyond on my eyelid. 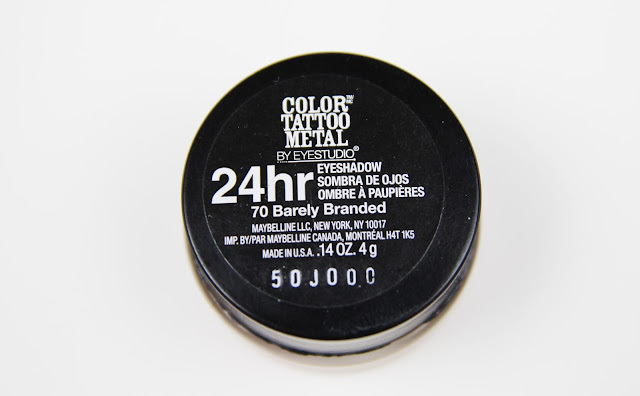 Like "Bare Study" I have worn this product alone on the eye and it gives a very fresh glowy look. And what is also amazing about this product, is the price, around $7(depending on where you buy). I also have to mention another thing quickly. When buying makeup products I am constantly thinking about how I can store the items in my MUJI drawers. This product fits perfectly in the five drawer, where the MAC Paint Pots do not. Size wise you could compare the Color Tattoos to the old benefit creaseless cream packaging! The real question here is... which do I prefer? Staying power and texture is about the same in both products. The Color Tattoo is a little more pigmented, which is a plus in most cases. As for color the Paint Pot is whiter and a little less warm. Overall I think I would choose the Color Tattoo, the price and the color payoff really just suit me best! I think this is a great cheaper alternative. 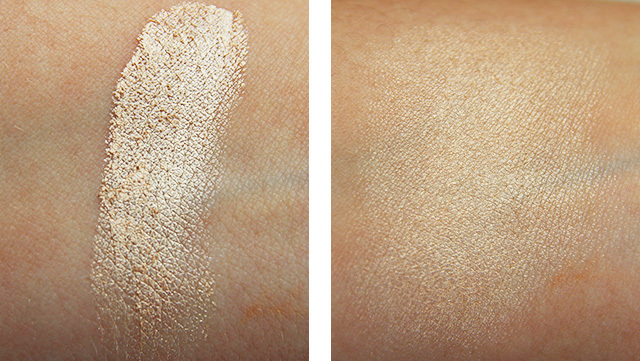 Maybelline Color Tattoo Metal in "Barely Branded" vs. MAC's Paint Pot in "Bare Study"
Great review!! I haven't tried the Bare Study Paint Pot, but I am definitely obsessed with the Color Tattoos in Barely Branded, Inked in Pink and Bad to the Bronze! I use them every day as a base (and sometimes alone) instead of a typical eyeshadow primer. Awesome product and great review! Let's follow each other? I have this one as well and I love it! I also have Bad to the Bronze and it's awesome too!! wow they are nearly dupes for each other. I normally never go for a shade like this, but you have convinced me otherwise, this will be useful in so many ways! Thanks love! Oh I really like this shade! I havent seen it over here in the UK, But when i do see it in my local boots I will be snapping that badboy up! I'm going to have to try these Colour Tattoos, I've heard a lot about them! This one looks gorgeous! Oh wow, these are gorgeous! Wow the color is so shimering and cute. really georgeus. 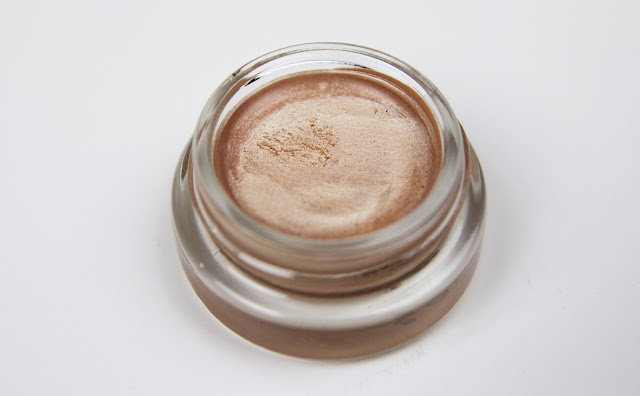 I´m thinking seriusly try this cream eyeshadow.